PLEASE DATE AND INITIAL YOUR FOOD. NOTE CALORIES AND FAT GRAMS IN THE CALORIC INTAKE LOG SO THAT THE COMPANY DIETARY CONSULTANT HAS AN IDEA OF WHAT YOU’RE EATING. IF YOU SEE A FOOD THAT OFFENDS YOU OR IS OUT OF LINE WITH YOUR DIETARY OR RELIGIOUS BELIEFS, PLEASE GIVE IT TO HUMAN RESOURCES FOR BINDING ARBITRATION. PLEASE DO NOT USE THE BRITA WATER PITCHER IF YOU HAVE NOT ATTENDED ORIENTATION (SECOND THURSDAY OF EVERY MONTH). IF YOU NEED WATER BUT DO NOT HAVE THE CREDENTIALS TO USE THE PITCHER, ASK LUKE IN ACCOUNTING TO TALK TO YOU ABOUT HOCKEY AND YOU’LL FORGET YOU WERE THIRSTY. REMEMBER: THE REFRIGERATOR DOOR SWINGS OUTWARD. PLEASE RESPECT THE DOOR’S SWING ZONE. IF YOU ARE UNSURE OF THE DOOR’S SWING ZONE, PLEASE ASK MANAGEMENT TO INDICATE IT ON THE FLOOR WITH A SHARPIE. 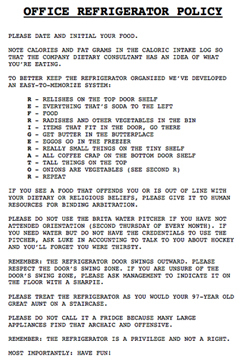 PLEASE TREAT THE REFRIGERATOR AS YOU WOULD YOUR 97-YEAR OLD GREAT AUNT ON A STAIRCASE. PLEASE DO NOT CALL IT A FRIDGE BECAUSE MANY LARGE APPLIANCES FIND THAT ARCHAIC AND OFFENSIVE. REMEMBER: THE REFRIGERATOR IS A PRIVILEGE AND NOT A RIGHT. Available in convenient workplace poster PDF.